We provide emergency backup power systems for many different applications, including data centers, office buildings, construction, telecommunications, food and beverage processing, agriculture, laboratories, and medical facilities. At the heart of many of these backup power systems is a standby diesel generator. Diesel generators are available in a wide range of configurations to meet almost any need. Some of the advantages of diesel generators are that they have relatively low maintenance costs, and are considered very rugged and reliable with long service lives. Diesel power generators, or electrical generator sets, are widely used in industrial and commercial establishments such as data centers, hospitals, and financial and commercial buildings. Diesel generators can be either prime power sources or standby backup power sources. Diesel generators have the ability to start and assume a load in less than 10 seconds, making them an ideal choice for industrial or commercial primary and back-up power systems. Power Solutions has a large selection of new and used standby diesel generators from top manufacturers like Caterpillar, Cummins, and MTU. Many of our generators meet EPA Tier 2, 3, and 4 emissions requirements, and can be customized to meet your specific requirements. We also offer natural gas generators. Natural gas is a dependable, clean and cost-effective option for your backup power. Industrial natural gas generators are primarily for prime and continuous clean power applications. 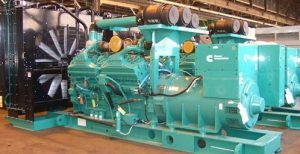 Power Solutions rents and sells used natural gas generators in custom mobile enclosures, oilfield skids, weather enclosures and open skid configurations from Caterpillar, Waukesha, Cummins, Arrow and more. For more information on the basics of standby generators, see our article about choosing the right generator for a data center. We have an inventory of diesel and natural gas generators in a variety of different sizes from all the leading critical power manufacturers in the industry. Call 800-876-9373, or email sales@power-solutions.com for more information on our Standby Generators.